Still, it’s an arresting title, and the poem, “After de Tocqueville,” in reference to the nineteenth century French sociologist/historian who famously analyzed American society and politics, reinforces the conceit. The epigraph, attributed to former French president Jacques Chirac, does too. “Nous sommes tous Américains.” The phrase, an echo of JFK’s “Ich bin ein Berliner,” appeared in Le Monde two days after the terrorist attacks of September 11, 2001. So the whole world is American? Fair enough. Indeed, there is a potent theme running throughout the collection of lives adrift in a material world, hoodwinked by a pervasive mythology that doesn’t stand up to examination and actually blinds us to “reality.” Five poems addressed to “Dear Suburb,” punctuate the collection. still looks like a butterfly, etc. Walt Whitman, there’s a touch of animal heat. Maybe only a truly great stranger can see it. Said Kerouac to Robert Frank, You got eyes. What are we seeing? What are we not seeing? where the real news is made. Nostalgia: inventing the past. Poems like “On the Bullet Train from Hiroshima,” “Love Field” and “Ambassador Hotel” point to other, sad, tragic versions of the American past. The latter two are about the assassinations of the Kennedy brothers, and perhaps hint at “where America lost its way.” If he is indeed making commentary here, note that Roderick was born in 1970, after these events took place. 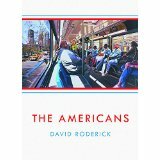 But I don’t want to quibble about “messages.” Roderick’s poems are frequently beautiful, eloquent, original expressions. Take that line, “Must nostalgia walk like a prince through all our rooms?” Wish I’d written that! Indeed, the collection is divided into two parts, and certainly the first part seems to be more about “the Americans,” whereas the second part seems much more personal, to me, at least. There’s a 5-part poem called “Green Fields” that partakes of Irish nostalgia, legends of the diaspora from the emerald isle, and Roderick also includes a couple of poems inspired by the Japanese Zuihitsu form, sort of stream-of-thought expressions without a form (the word means “follow the brush”). Made solid print for me across dawn’s broken arc. The Americans is a collection of poems that gives pleasure from any of a variety of perspectives or intentions. Pick one.